If you want to make a little boy (or big guy) happy, make him banana bread for breakfast. It’s a proven fact. (I hear little girls like it too, but I don’t have any daughters to confirm this rumor.) And since I’ve been baking with coconut flour for ages, making a coconut flour banana bread was a piece of cake, er, slice of bread. Even though I LOVE the texture of coconut flour (it’s my favorite for cakes & muffins), it’s a little dense and the flavor can be overpowering in some recipes. My very favorite paleo baking recipes are the ones in which I combine two or more flours to create that just-right texture. It’s how I came up with my Ultimate Paleo Chocolate Chip Cookies (if you haven’t made them, what are you waiting for???). You know that cassava flour is a favorite around here, because it most closely mimics white flour in lots of recipes, but there is a learning curve. Overdo it, and the finished product will be gummy, but get it just right, and you may convince even your friends who eat wheat that they won’t be missing out if they go grain-free. Our family has been (mostly, off-and-on) grain-free for over five years now. We’ve learned what works for us and have healed our guts enough that we don’t have to stick with a super rigid diet, but the fact is, we all feel best (and behave best) on a grain-free diet. lectins- found in legumes and grains, lectins are a part of plants’ natural defense mechanisms. They are difficult to digest and can even damage the cells that make up the gut barrier, contributing to leaky gut. gluten- found in wheat, barley, rye, and some oats, gluten is a difficult-to-digest protein. It’s especially problematic for children with behavioral disorders because it can bind to key receptors that effect mood and behavior, as well as those with autoimmune diseases. Today’s processed and pesticide-laden wheat is best avoided by everyone. phytic acid- an anti-nutrient that blocks your body’s absorption of minerals. Not only is it difficult to absorb any of the nutrition found in grains themselves, but they may prevent you from absorbing nutrients from the other foods you eat along with them. It’s because of these problematic elements of grains that our family chooses to skip them for the most part. We’re also human and enjoy occasional indulgences and even made a party of eating at Chick Fil A this week while our house was being shown (remind me to tell you about that time we sold our house with four children underfoot and a husband traveling the majority of the time- I’ts. A. Walk. In. The. Park.). I’ve found we do best with balance and without being too controlling, but still focus on most of our diet being nutrient dense. Which is why I have to come up with grain-free recipes my boys love like this coconut flour banana bread. The rest of us rather liked it too. We grabbed it as a snack before heading out when our house was being shown… and before going to Chick Fil A, because boys are always hungry. Cassava flour is not low carb, but with all the fiber in this bread, I feel great about adding it in. 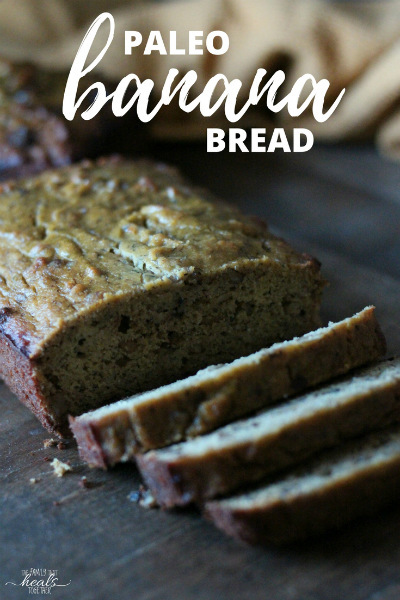 Plus, this bread doesn’t have a lot of added sweetener since bananas are already sweet, so it’s great for breakfast with a smoothie or protein drink (like bulletproof chocolate milk or tea), or a tall glass of raw milk. 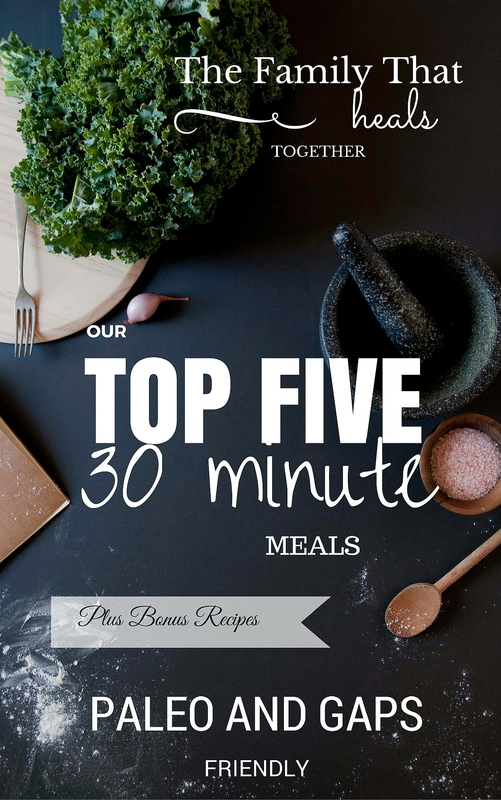 Get my favorite cassava flour here. Tip: add chopped nuts or chocolate chips for a yummy treat- I made one of each and the boys loved both! Grab the recipe for Cassava and Coconut Flour Banana Bread below. Grease standard-sized loaf pan (I love this kind) with fat of choice. In a large mixing bowl, use a hand mixer to mash the bananas. Add the eggs, vanilla, oil, and maple syrup and mix on high until combined well. It's ok if the bananas are a little lumpy. Add the flours, baking soda, and salt, and combine once more until smooth. Add nuts or chocolate chips, if desired, and stir by hand to disperse. Pour into prepared loaf pan and bake for 40-45 minutes, until a toothpick inserted into the middle comes out clean. Cool before slicing and serving warm with butter or ghee. 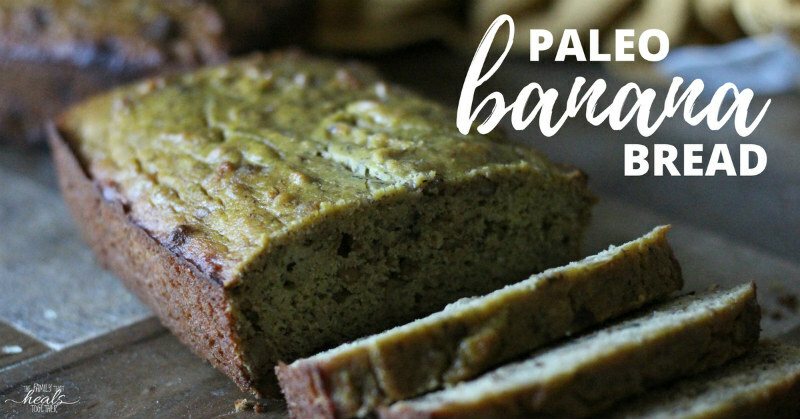 Share this Cassava & Coconut Flour Banana Bread recipe by pinning or using a link below. Could I sub pumpkin puree for banana? Has anyone tried making this without maple syrup?